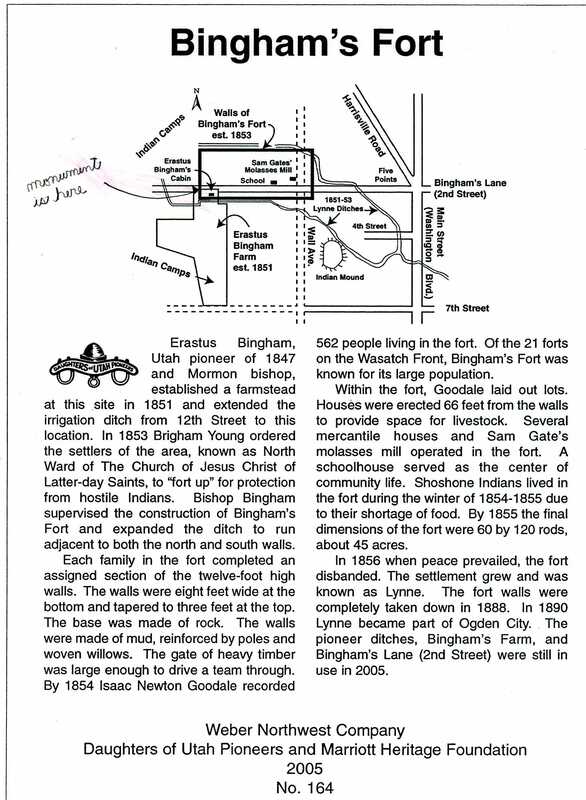 Bingham’s Fort monument stands at approximately 327 West 2nd Street in a pasture of the Bingham/Stone Farm. The west wall of the fort crosses 2nd Street here and is designated by the cross-walk; the red “ghost cabin” on the left represents one of the Bingham cabins. 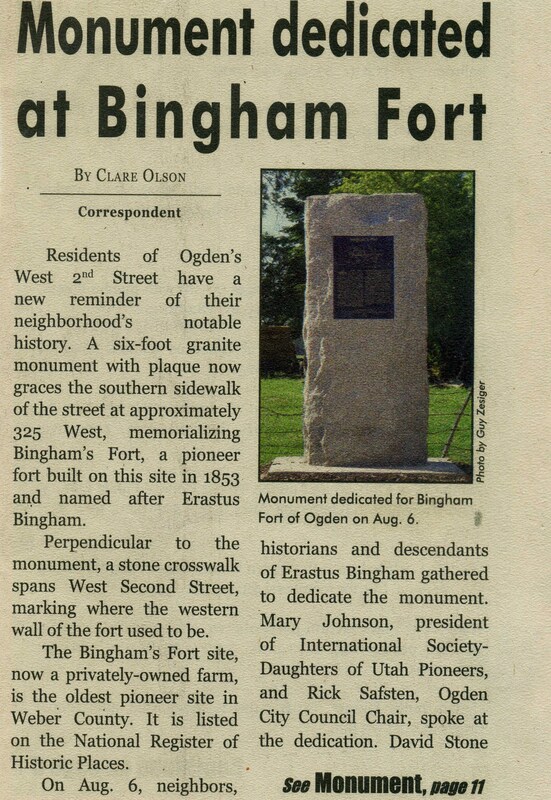 On June 23, 1951, the Bingham Family Organization and the the Central and Weber Companies of The Daughters of Utah Pioneers dedicated a historical marker at Five Points to memorialize the location of Bingham’s Fort on West 2nd Street. 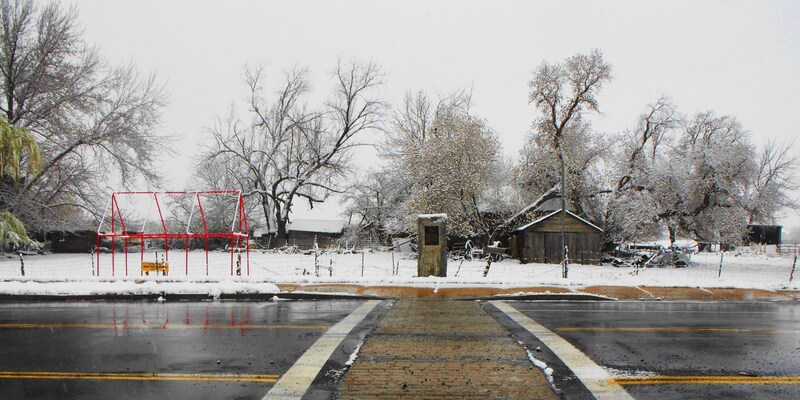 The monument stood on the Harrisville Road next to the Ogden 15th Ward chapel (now Bank of Utah). By 2004 the traffic and busyness of the roads made it hard to notice the monument or read it. So the monument was relocated to a more accessible location on West 2nd Street and given a new plaque. 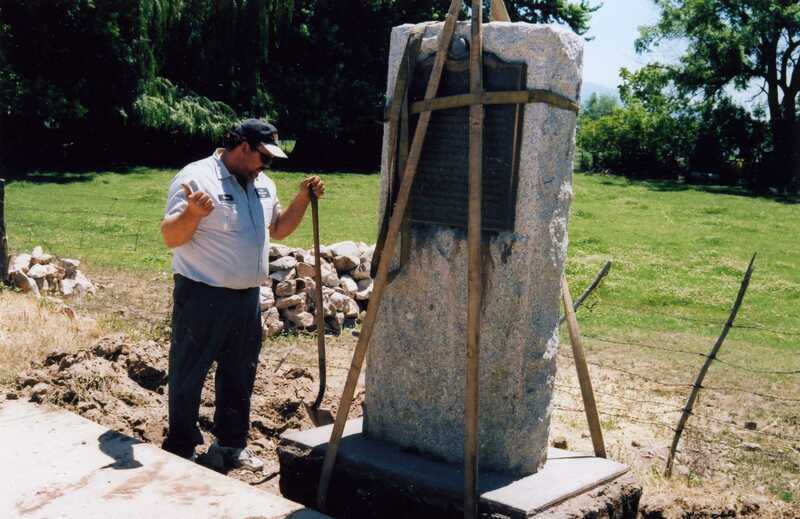 Bingham’s Fort Monoument on the Harrisville Road; photo 1997. 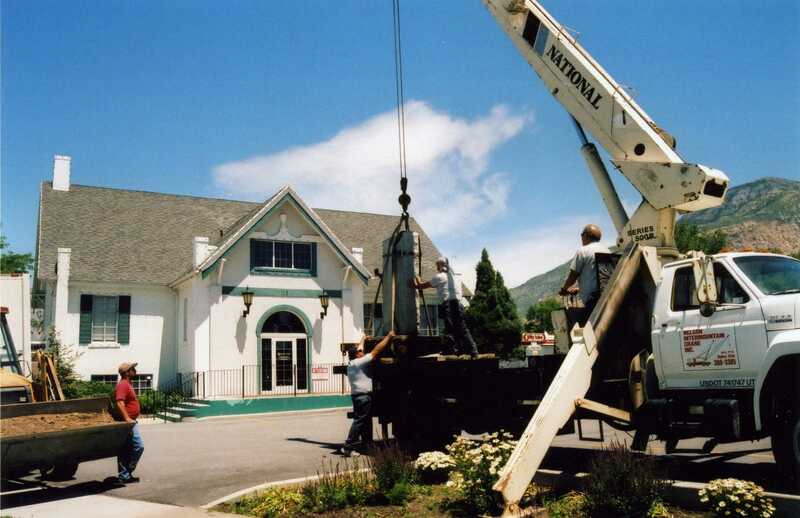 In 2004 the monument was relocated to West 2nd Street; Nelson Crane donated their men and machines in this service to the community. 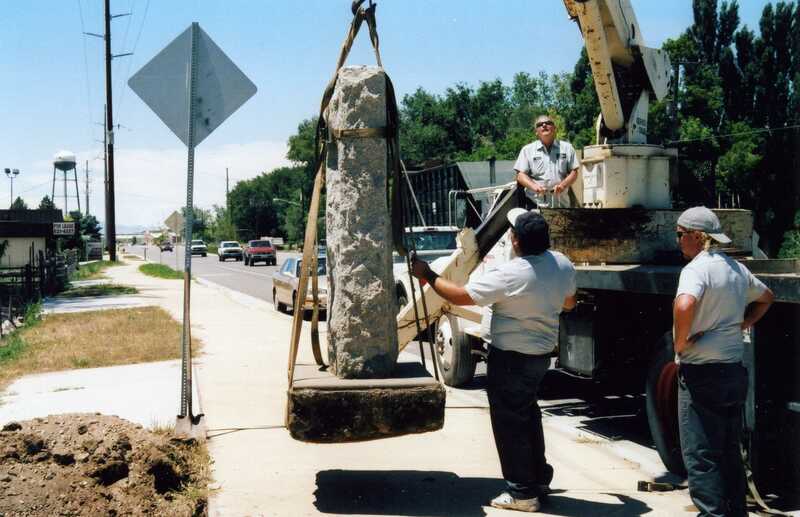 After 53 years on the triangle at Five Points, the monument was moved to West 2nd Street and placed in front of the Bingham/Stone farm. Thanks to Nelson Intermountain Crane and Busenbark Construction who worked together to put the monument in place. 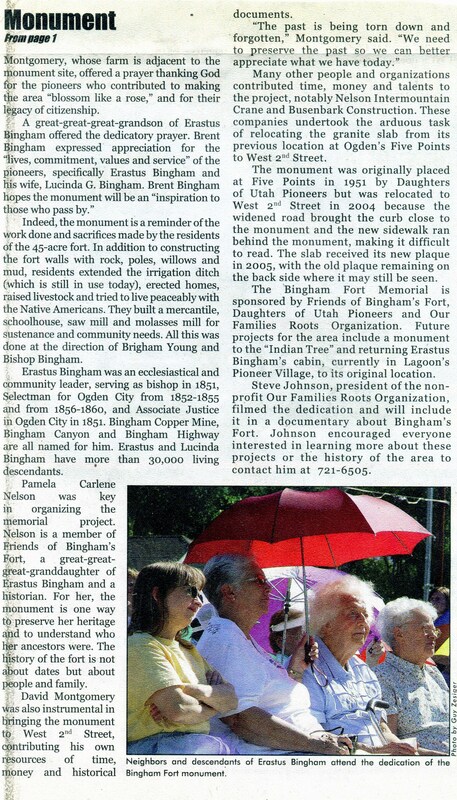 On August 6, 2005, the Daughters of Utah Pioneers and Marriott Heritage Foundation dedicated the new plaque on the grey granite monument (text recorded above). Rick Saffron of Ogden City Council and Mary Johnson, President of the International Society of the Daughters of International Pioneers, addressed the crowd. Brent Bingham offered the dedicatory prayer.